The photo was taken on April 29th, 1996 at a speaking engagement given by Governor Jim Edgar at the Central Illinois Chapter of the American Society for Public Administration. Governor Jim Edgar is in the center of the photo. On his right is Samuel K. Gove, Charter member of the local ASPA chapter and introduced the Governor. On his left, Richard Carlson, who was President of the local ASPA chapter and Executive Director of the Illinois Comprehensive Health Insurance Plan. Both Edgar and Carlson are former students of Gove when attending the University of Illinois. 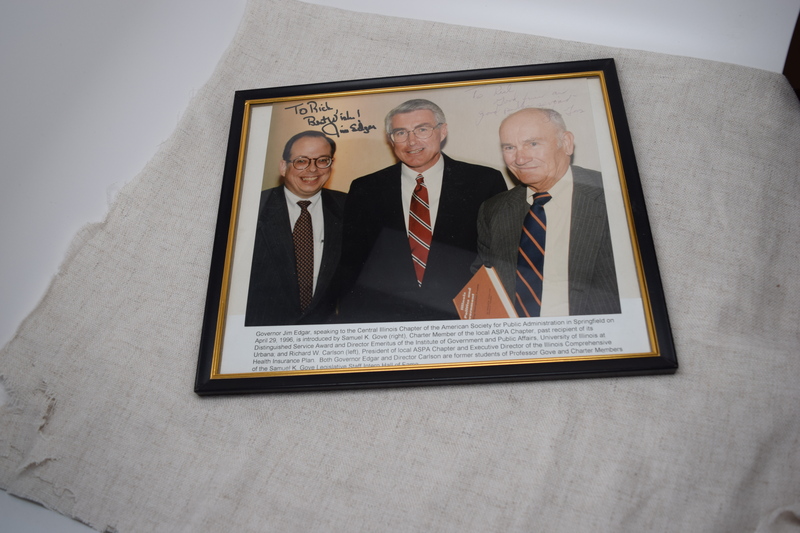 Signed & Framed Photograph of IL Republican Governor Jim Edgar with Samuel Gove, and Richard Carlson, April 29, 1996. 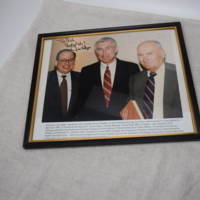 “Signed & Framed Photograph of IL Republican Governor Jim Edgar with Samuel Gove, and Richard Carlson,” UIS History Harvest, accessed April 19, 2019, http://uishistharv1.uis.edu/items/show/229.